New Englanders were treated to an exceptionally warm October and most of us have not seen any flakes of snow this November either. However, with Thanksgiving approaching fast, we are bound to see flakes hit the ground soon. 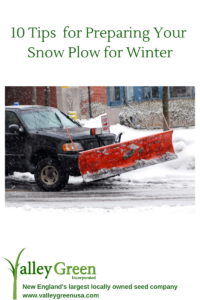 Now is an optimal time to get your plow prepped to face Mother Nature for winter. Check to make sure your plow is in good working order before the snow flys! Here are 10 tips to get your plow ready for the season. 1. Check all the fasteners and bolts of the plow. A loose plow can be disastrous in many ways. 2. Check all the lights on the plow to make sure they are in proper working order. The lights ensure the safety of you and others. 3. Check your welds on the plow mount. Even these can come loose, and it is better to be safe than sorry. 4. Look at the tread and cutting edge of the plow. Replace them if they are worn. 5. Replace your hydraulic fluid. 6. Have your battery tested and inspected by a professional. Getting trapped in a storm is the worst! 7. Inspect the vehicle you will be plowing with as well. Checking the tires and wipers for wear is especially important. 8. Inspect plow pins and fasteners to make sure they’re not too worn. These are usually cheap and easy to replace. 9. Clean and add dielectric grease to all electrical connections. 10. Make an emergency kit including extra hoses, fuses, trip and return springs, hydraulic fluid, solenoids, tow straps, flares, and a shovel.